Structures of computers; the computing environment. Programming in Java. Elementary data types, statements, control flow, functions, classes, objects, methods, fields. Lists; searching, sorting and complexity. Java was the programming language used when I took this course. Dr Java was the beginner’s IDE, with simple debugging and compiling controls. JUnit was the testing tool used for this course. This course is an introduction to object-oriented programming and serves as the beginner’s guide to basic programming such as the if statement, while and for loops, arrays, updating variables and different sorting algorithms such as selection sort and insertion sort. As a final assignment, the professor asked us to program a simple game. The game is called Maze Race (similar to the Atari 2600 classic Maze Craze), with two players, Ada (denoted A) and Charles (denoted C). 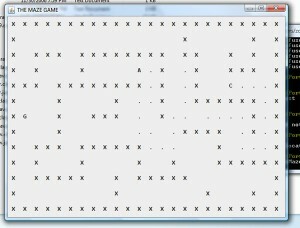 Each player moves in a confined maze with boundaries and the first to reach the goal (G) wins the game. Backtracking through the maze is not allowed. 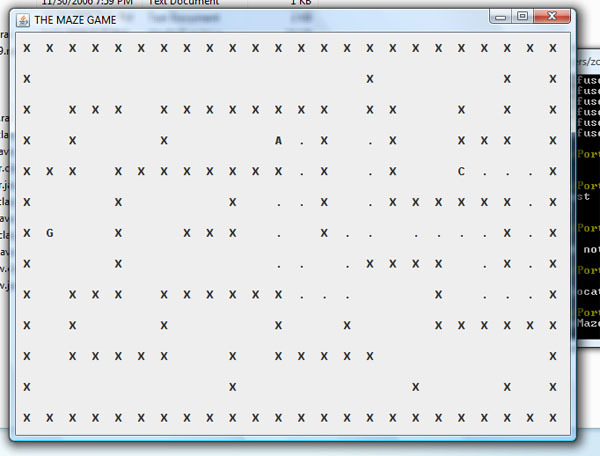 The game is run on the command line, supports both text and GUI versions, and uses an external txt file as the maze. Maze Race, the first to reach G without backtracking wins!